CROCKETT – U.S. 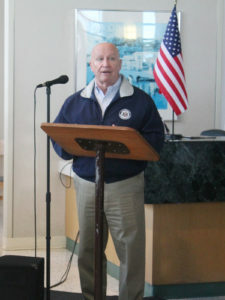 Congressman and Chairman of the House Ways and Means Committee Kevin Brady visited the former ETMC Crockett campus on Tuesday, Jan. 23 to pledge his support to members of the Houston County Hospital District (HCHD) and the local area in the ongoing quest to reopen the hospital. Former U.S. Congressman and Crockett native Jim Turner expressed gratitude for Congressman Brady making the trip from Washington, D.C.
As Turner explained, the hospital was operated under the direction of East Texas Medical Center of Tyler for between 20 and 25 years. “When that lease ended, East Texas Medical was kind of pulling back some of its satellite hospitals, and that ended,” Turner said. The HCHD, Turner explained, was left with no choice but to hire a management company in order for the hospital to remain open. Just nine months after signing the lease, however, Timberlands officials made an unexpected announcement that the hospital would be closing in nine days. The HCHD immediately began searching for a potential partner for the hospital. “One of the things that we learned is that because the hospital in Trinity had closed a few months earlier, we were now eligible to be classified as a critical access hospital because we’re 35 miles away from another hospital,” explained Turner. Following the critical access designation, the HCHD began receiving interest from various hospital systems, including Crockett Medical Center, LLC of Austin. Dr. Kelly Tjelmeland and Dr. Subir Chikara subsequently made a presentation to the board. As Turner pointed out, a number of events are required to take place before the hospital doors will be able to reopen. After obtaining the operating provider number, the next step of the process is applying for critical access status, which involves an additional 60-90 day waiting period. As Turner pointed out, the reopened hospital will “bleed cash” throughout its first six months of operation. It is estimated that six months after reopening, if no critical access designation is acquired, the hospital will be faced with a $150,000 deficit each month. As Turner pointed out, Dr. Tjelmeland and Dr. Chikara saw a great deal of potential in the hospital. “They looked at this hospital, and they concluded that this hospital didn’t close because it wasn’t doing well – in fact, it was improving under Little River,” Turner said. According to Turner, the Little River Corporation appeared to be facing cash-flow issues within the larger portion of the company. “They closed us, and they’ve taken the cash ever since,” he said. “They’ve been collecting all the bills ever since. People in town still get bills from Timberlands and Little River. 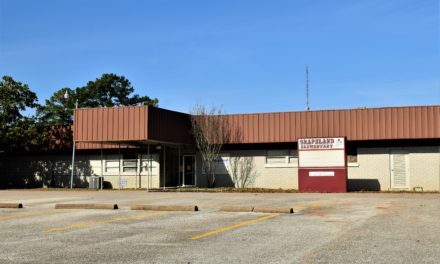 “What they saw and what we believe is that our hospital is one that should not close, that has the capability of operating properly in this county and in this community and that Little River, frankly, needs to be held accountable for what they did by breaching their 25-year lease nine months into the lease,” Turner continued. Turner expressed great appreciation for any action which Congressman Brady saw possible to contribute. Congressman Brady praised the efforts of the HCHD to keep the hospital operational throughout the struggles they have faced. As Turner explained, Dr. Tjelmeland and Dr. Chikara will be obtaining “the permit for operating a hospital that has been held in abeyance and not revoked ever since the hospital closed” from the state office Friday, Jan. 26. 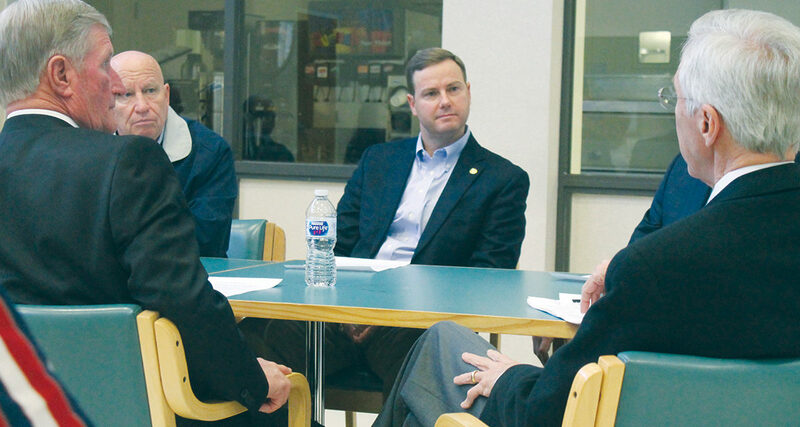 The permit being held in abeyance rather than being revoked, Turner said, was made possible by the efforts of State Representative Trent Ashby. Turner also expressed gratitude for Dr. Tjelmeland and Dr. Chikara. “These two gentlemen, along with another investor who has been a silent partner, have committed the funds necessary to reopen this hospital,” he said. As Turner explained, following the closure and reopening of a hospital, no billings from the federal government or insurance companies are able to be collected for a period of roughly six months, even after a provider number is obtained. “We all know that it’s going to take someone with deep enough pockets to sustain the reopening of this hospital, and we are very grateful that these two gentlemen and the commitment they’ve made will allow that to happen,” Turner said. “This board is committed to working very closely with them to ensure the success of what has to be a true partnership between this community and these hospital investors and physicians that have come to us. “We’re very pleased, and we thank both of you for having faith in Houston County and the future of healthcare here,” he continued. According to Congressman Brady, the leadership of Turner “is one of the reasons why this hospital is going to reopen. “This is crucial to the future of Crockett and Houston County,” Congressman Brady pointed out. Congressman Brady expressed the belief that the community of Crockett has “a lot of remarkable things” going for it, namely the dedication of the community to bringing healthcare back to its residents. Congressman Brady described the hospital as “an amazing facility. According to Congressman Brady, having two investors who recognize the potential of the hospital is also a positive asset. “Your taking such a hard look at this facility, recognizing what this can be and the importance for the community and making that investment speaks a whole lot to you gentlemen and what you know you can deliver,” Congressman Brady said. As Congressman Brady pointed out, the doctors investing in the hospital are “not interested in just opening the facility,” but “in bringing top-notch quality care long-term to the community. According to Congressman Brady, completing all necessary paperwork should be completed as soon as possible with the contract between the hospital and Crockett Medical Center. “It really is critical that we get through the paperwork so that the reimbursement can flow; so we get the right designation; so this facility long-term can provide quality care for Crockett and Houston County. Turner’s outlook on the hospital is a positive one. “Between Kevin Brady and Trent Ashby, we cannot fail,” he said. Sarah Naron may be reached via email at snaron@messenger-news.com.